Residence Montana Plein Sud . Résidence Pierre & Vacances Le Tikal price per day from € 58 . Résidence Pierre & Vacances Aconit price per day from € 49 . Residence CGH Les Clarines . 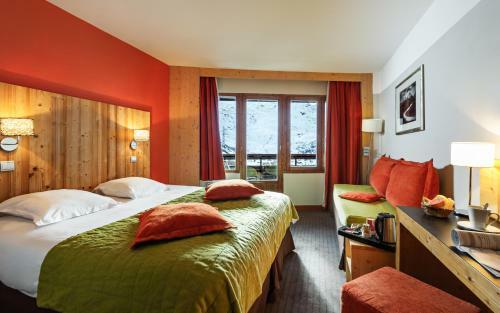 L'Isatis Chalet Hotel Located in Les Menuires, L’Isatis Chalet Hotel is 8 km from Val Thorens and a short walk from Les Bruyères ski lift. It offers free Wi-Fi, a restaurant and chalet-style rooms and suites featuring a balcony with a hot tub and mountain views. The private bathroom includes free toiletries and a bath or shower. Hôtel des 3 Vallées . Hillary Hotel price per day from € 76 . Hôtel Les Bruyères price per day from € 160 . Les Temples du Soleil Val Thorens . Hotel Koh-I Nor Val Thorens Located on the Val Thorens Ski Slopes, Hotel Koh-I Nor offers ski-to-door access in the highest resort of the Three Valleys ski area. Guests will enjoy its spa, 2 indoor swimming pools, panoramic terrace and restaurant. Guests can enjoy the fully-equipped spa with a hot tub and sauna..
Museum Mont Corbier, Saint-Jean-de-Maurienne, 15.8 km from the centre of town of Les Bruycres. Museum l'Opinel, Saint-Jean-de-Maurienne, 16 km from the centre of town of Les Bruycres. Ski resort Albiez Montrond, altitude: 1500m. 19 km from town of Les Bruycres. Ski resort Aiguilles en Queyras, altitude: 1450m. 63 km from town of Les Bruycres. Ski resort Abriès, number of cross country pistes: 40km. 64 km from town of Les Bruycres.